Traditionally, the upper arms can be one of the hardest areas of the body to keep toned and contoured. Even for patients who do not have a lot of excess fat, 'bingo wings' may be present to some extent. This is especially true for women, who is more likely to have a lower body weight, but is more likely to have a high blood pressure. There is a body contouring surgical procedure to reduce the appearance of the upper arms. This is called Brachioplasty. However, this is best for people who have a lot of excess skin in the area rather than fat. People who have lost a lot of weight in this condition. For those who are wanting to remove fat from the arms, liposuction is the most effective way of doing so. Liposuction would be easy to get rid of, and will only be allowed to be concealed. However, traditional liposuction is not without its problems, as the fat is drawn out through a suction cannula which can be traumatic to the tissues. Vaser liposuction, however, is an innovative surgical system of fat removal that eliminates the need for it. During Vaser treatment, the fat is first emulsified via small probes emitting ultrasound energy, which liquefies it and allows it to be sucked out through a cannula very easily. The ultrasound energy vibrates the fat cells and disrupts them without damaging any adjacent tissue. In this way it is only the fat cells themselves which are disrupted. The fat removal is carried out with fine cannulas but since the fat has been emulsified this removal is very gentle and more precise which allows delicate contouring and enhances the definition of the underlying normal shapes and curves of the body. How is Vaser liposuction carried out? As the upper arms are a smaller treatment area, it might be possible to have the surgery under local anaesthetic, so that you are awake throughout the procedure. However, some people prefer to have the surgery under general anaesthetic which can still be carried out as a day case procedure which means you can go home the same day. Mr Chana will discuss carefully the pros and cons of each anaesthetic type during your consultation, and you will be able to reach a joint decision about which is right for you. The scars for the liposuction are very small and usually hidden in the armpit or in a crease above the elbow. These openings are closed with dissolvable stitches and a compression garment is applied. What are the typical results of Vaser liposuction to the arms? The main consideration is whether the skin is too loose for Vaser liposuction alone and whether skin needs to be removed. 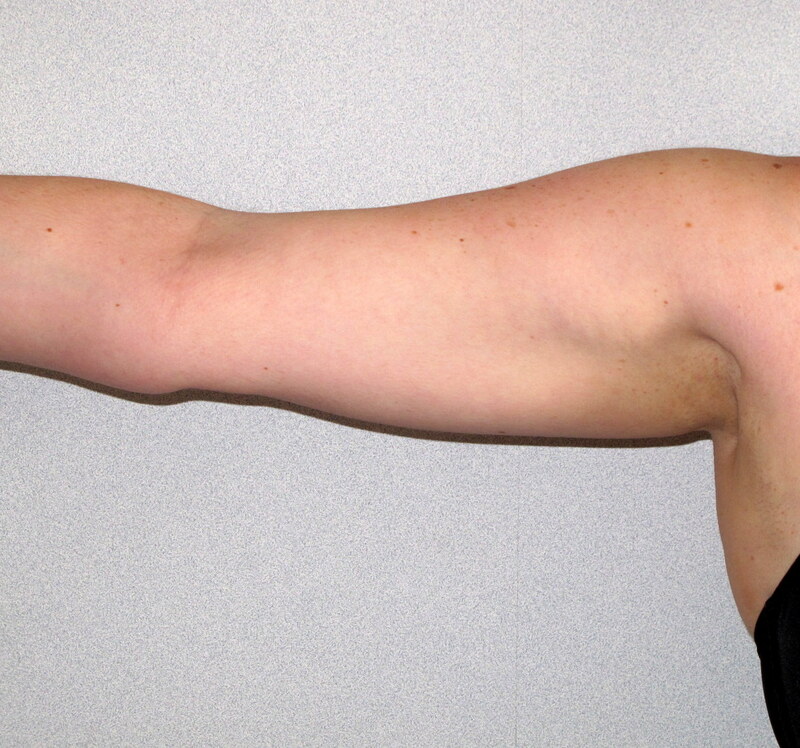 Although Vaser has a skin retraction effect there are many individuals in whom this will be insufficient and a Brachioplasty with a resulting longer scar will be required. This will be carefully assessed at your consultation with Mr Chana. The patient below is a typical result following Vaser liposuction to the upper arms showing reduced and more defined upper arm contour 3 months after surgery. What is the recovery after Vaser liposuction of the upper arms? The recovery after the procedure is only a few days but a compression garment will need to be worn for between 3 to 6 weeks dependent on the amount of fat removal. If you are unlucky there will be some bruising and this may last 2 weeks. You will need to refrain from upper body exercise for 6 weeks. The best results are seen between 3 to 6 months since it takes time for the tissues to settle and the skin to retract. More about Vaser and how to book a consultation? Vaser is a versatile treatment that can be used in many parts of the body and offers bespoke and targeted body contouring to most commonly identified problem areas. If you would like more than one area treated with Vaser, speak to Mr. Chana during your consultation about the possibility of a dual treatment, and whether you are a suitable candidate for it. Mr. Chana was one of the first BAAPS approved surgeons to invest in and perform Vaser technology in his clinic, and has been using it since 2009. You should be wary of any clinic or doctor that advertises Vaser as a non-surgical alternative to liposuction. While the procedure is less invasive and offers shorter recovery times and less inconvenience to the patient, it is definitely still a surgical procedure and should be treated as thus. Going to a qualified, experienced practitioner like Mr. Chana will allow you to get the results you want in a safe and controlled environment, and will also allow you to have realistic expectations about the surgery and take the proper precautions to ensure safe and effective recovery. 1. To ask any questions you might have about the procedure. Even if you read up on Vaser, there may be some unanswered queries that you have not seen. Express any concerns you might have, too - Mr. Chana is an expert on Vaser and will be able to answer you clearly and fully. 2. To explain to Mr. Chana the results you are hoping to gain from your surgery. It might be so, but it's a good idea to be so helpful. But of course, you should be realistic about the results you can achieve through surgery alone. 3. To meet Mr. Chana and get to know him prior to your surgery. This is a key component in many patients' day-to-day operations and it facilitates the use of a treatment plan.